This limited collection that is now available for purchase in the shop! Ever since my rock obsession began when I was little, I was always in awe of the beauty and mystery behind opals. Before taking metalsmith classes about two years ago, I dreamed of being able to set pretty, sparkly, glowing opals in jewelry. I’m thankful that the day has come that I have built up enough skill to create this delicate new line of waterdrop-shaped Ethiopian Welo opal rings. Each unique and fascinating with her own fire & glow, these opals are gorgeous and the highest quality you can get, AAA grade. This grade is given to gemstones that are clean, well cut and polished and considered “being near perfect.” This specific type of hydrophane opal is found in Welo Province in northern Ethiopia. There are ways to take good care of your opals to prevent any harm or breakage to the stone. 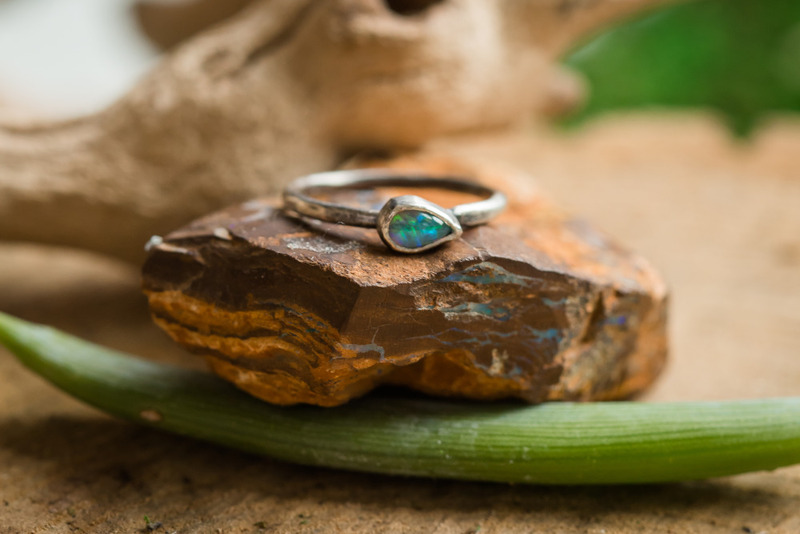 AmazziRoots suggests that you remove your Welo Opal ring when you wash hands, bathe, and go swimming to prevent the ‘fire’ from becoming transparent. If this happens, don’t fear! These special opals will dry out and eventually regain their glow. I believe this ring is an excellent representation of what AmazziRoots is all about. This ring is a symbol for how beautiful and rare clean, safe, sustainable water can be. These opals were not synthetically made; they were mined in Ethiopia, right where the incredible ACT Project is taking place to help provide access to clean water, sanitation & hygiene, and HIV/AIDS clinics. So thank you for those who purchase a Welo Opal ring, 10% of your purchase will go towards Blood:Water Mission who has partnered with ACT to improve lives in the Suki community in Ethiopia. Check them out in my shop here for the Lightened version and here for the darkened version. Enjoy!